Solar gain, our energy efficient windows are manufactured using the latest technology in glass and spacer units. 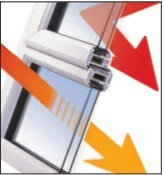 This allows heat generated from your home to be reflected back into the room but also trap free heat from the sun through solar gain, thus maximising the thermal performance of our windows. Call us today if you have any questions about Energy Efficient Windows.